Whether you're testing solar panels, grid-tied photovoltaic inverters, or photovoltaic cells and modules, Hongzhan can provide a solar test system customized to your testing needs. Our three-pronged approach allows you to find everything you need for your testing demands: a variety of test chambers, specially designed fixtures, and integrated product control & datalogging. Solar Photovoltaic (PV) modules and panels are growing in popularity among consumers due to emerging renewable energy trends. The near future holds the ability to power vehicles, cell phones, laptops, lamps and aircrafts with solar panels. In order to effectively power these devices, the solar panel must be able to withstand their likely environmental surroundings. To test the panels against their environment, many considerations need to be made before test equipment is selected. First and foremost, the types of tests need to be designed based on test standards such as IEC 61215, IEC 61646, IEC 61731 and UL 1703. Solar panel dimensions also need to be considered. The chamber needs to accommodate the quantity of panels being tested, as well as the loading technique to optimize efficiency. One must decide whether or not the panels will be powered on during testing, determine the level and sophistication of functional testing, and the data measurement and acquisition needs such as temperature, voltage, and current. The versatility of these panels to power a wide range of devices means that determining testing methods and proper test equipment is a critical phase in manufacturing these products. Carefully crafting proper test procedures will help ensure a long product lifecycle. Withstanding a load of up to 900 lbs (408 kg). The chamber's solid construction insulated floor gives the chamber the ability to test a multitude of panels simultaneously. 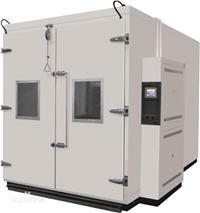 Utilizing easy to handle prefabricated panels, WP-Series chambers allow you to create a workspace to meet almost any testing or size requirements. Withstanding extended temperature and humidity ranges and enable faster temperature change rates because of welded and insulated walls.